One of the results of our recent parish Spiritual Inventory is data indicating that few Good Shepherd parishioners use the Book of Common Prayer in their daily or weekly devotions, and few parishioners understand why the Book of Common Prayer is a valuable resource for spiritual growth. Although our Sunday morning worship service is taken directly from the Prayer Book and we use the Prayer Book for funerals, weddings and special days, like Good Friday and Ash Wednesday, many Episcopalians, especially those who didn't grow up in the Episcopal Church, have little experience with this treasure-trove of spiritual resources. On the Sundays of September, during the Adult Faith Forum, I will continue to lead an exploration of the Book of Common Prayer, and a discussion of how this book can be help us grow in our spiritual lives. With the change in worship times beginning August 6, the Faith Forum will now begin at 9 am and conclude at 9:50 am in the chapel/conference room. This new schedule will provide more time for discussion than our previous schedule. 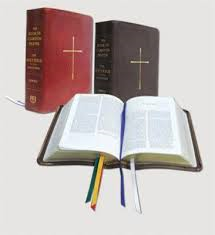 The Prayer Book is one of the great gifts that the Church of England has bestowed on the Christian Church. It was created by the first Archbishop of Canterbury, Thomas Cranmer, in 1549, at the beginning of the English Reformation, when the English people began worshipping in English instead of Latin. The Prayer Book included a new translation of the Psalms by Matthew Coverdale, which has had a huge impact on English literature and Christian spirituality for hundreds of years. Join us for this thought-provoking and inspirational discussion. September 24: How Can the Prayer Book Be a Resource for Spiritual Growth?